What happens when the love of your life is about to die? In this compelling story of selfless courage and compassion, Cheryl Eckl chronicles how she and her beloved husband, Stephen, moved beyond merely coping with his imminent death from colon cancer to approaching it as one of life’s great mysteries—a process of profound learning, mutual devotion, and deep personal growth. Writing with stunning candor and immediacy, Cheryl takes the reader on a journey that plumbs the depths of loss and soars to the heights of the soul’s release—even providing a powerful glimpse into the Other Side of life. A Beautiful Death – Keeping the Promise of Love offers comfort and hope. And may even change how you view life’s inevitable end. Watch & Listen as Cheryl explains the difference between A Beautiful Death & A Beautiful Grief. A Beautiful Death is beautifully created, from the lovely, textural cover that conveys a sense of pressed leaves–wanting to keep something beyond its life cycle, wanting to hang on to a season, to the lyrical writing. The author is brave in her admissions of the weaker moments in grieving, and fully honest in the moments leading up to and leading from loss. Opening with Thich Nhat Hanh’s quote is a great start, beckoning the readers of spiritual insights to bring their belief minds into this tale, resonant and engaging, a universal truth that brings great comfort to the reader. Nicely chosen, as are all the quotes curated for this book. The strong opener (“Someone is dying. And life will never be the same.”) cuts right to the truth of loss. It’s really quite simply said aloud like that, but internally, there are so many layers to it. And the author deftly handles those layers in this unfolding of not just Stephen’s death, but the magic of their relationship prior to that moment when life departs, and the careful, difficult steps afterward. The author creates those beautiful, simple truths so gorgeously here, from the image of her eating a sandwich in the car after the viewing (reader will relate), to the reality that sharing the news of the passing is making it real. These steps after the death, she shows so beautifully here, are also part of helping to create a beautiful death. [The] author paces these glimpses into this time of her life well, with no sense of rush, no glossing over. If the reader has been in her shoes, it’s recognizable that the path of grief is swirled, and that we still have so much we want to express to our departed. The letters are lovely, written with a natural voice so full of emotion, it’s moving. Very brave moment on page 58–Stephen wants her to go out with her friends, but she says of the change in how they can spend time together, “I feel like a widow,” before the dying person is gone. So unique and brave a sentiment. The author earns our admiration early, and it just keeps on growing. Beautifully done. This is the story of how I found Stephen—the love of my life—lost him too early to cancer, and then discovered a way to reconnect with his spirit. My experience has proved to me that the worst thing that ever happened in my life was also the most important. That death, while not easy, can be beautiful. And that love is, indeed, eternal. In 2004 I was living a dream. I had been married to Stephen for 14 years and life was great. But when he was diagnosed with terminal cancer, I suddenly found myself on an unexpected and unwelcome journey with no road map. Dying is something we will all do in this life, and it is likely to be difficult; but what matters is who we are being while we’re doing it. That’s what Stephen taught me, and that’s the story I fashioned from the journals I had kept during our 18 years together. Throughout Stephen’s illness and eventual passing in 2008, I found that reading how other people faced death gave me courage and confidence that I could walk up to that final doorway with my beloved. I hope that reading A Beautiful Death does the same for you. This is a beautiful book about a beautiful death, truly. With great skill, wisdom, and grace, the author shares a story that is both heart wrenching and heartwarming….She helps the reader fall in love with her, and with her husband, and then allows the story to unfold.…This is a book filled with poetic images, poems, and diary entries, all of which work very well. Sometimes her language leaves the reader swooning, with appreciation for the artful way she has written them and because they pierce right through to your soul. I am so deeply gratified when readers tell me they can’t put the book down, or that they know several people they want to give it to. Here are just a few of the unsolicited comments that have come from actual readers. If you have a testimonial to share about the book, please send it to me via e-mail at Cheryl@cheryleckl.com. 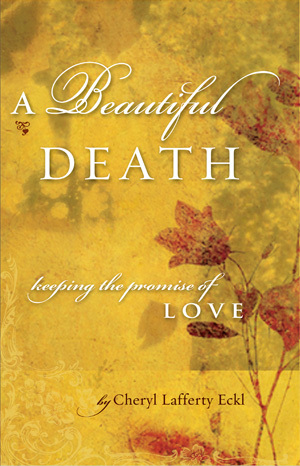 Cheryl, I read your wonderful book, A Beautiful Death, before, during and after my late husband’s dying process. I read each part as I was experiencing the phase about which you wrote…when I was ready to move on into that stage. I felt as though someone was holding my hand every step of the way and I am forever grateful that this book found its way into my hands. I have lost two wonderful husbands to cancer, one in 2004 and now again in 2011, and am fighting a metastatic breast cancer diagnosis myself, so know that what you write about is authentic and close to the heart. Bless you and the work that you do. Yesterday I was talking to a patient and his partner. I could feel the anguish of a future separation reverberating in their souls as they contemplated the end of one of them. It would be sooner rather than later. And the question of hospice hung in the air. They were conflicted because of the great deep love and devotion they shared for the other. The leaving behind is unbearable. Not the death. I said to them both “death can be and is a beautiful thing.” The words hung in the air. I finished your book yesterday and found it very moving. It truly is a gift that you shared the time you had with Stephen in the physical realm– as well as the ongoing spiritual connection that I am sure you have, which is timeless. Reading the book also helped me to think ahead and have a good sense of what I may be facing as my husband and I experience this journey together. We have hope for a complete remission, but also understand the reality of the situation and the possibility that it may simply be his time–sooner than later.